Replacement wedge-base lamp socket that will fit nearly any make/model. Fits inside pop bumper bodies, with insulated wire leads that go down through bumper body & base and to underside of playfield. Uses #555 type lamp or LED. 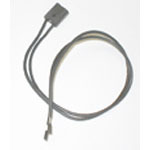 Replaces Bally # E-120-194, Data East/Sega/Stern # 077-5206-00, Bally/Williams # 24-8776-1 and A-11199.